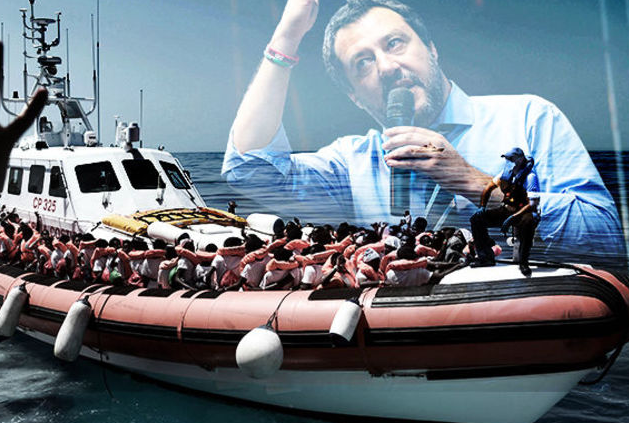 Days before the EU countries hold an emergency summit to discuss immigration, Italy’s de facto leader, the hard-line interior minister Mr Matteo Salvini, put the knife in Chancellor Angela Merkel’s back a bit deeper by refusing port to a Dutch-flagged rescue boat with 224 migrants on board, only a week after he had turned away another foreign ship, the Aquarius, carrying 630 migrants. Italian authorities declared that they would be seizing and impounding the migrant rescue ship Lifeline, after it failed to clarify whether it was carrying a Dutch or a German flag. The ship, operated by German NGO Mission Lifeline and flying a Dutch flag, had earlier requested the right to enter an Italian port after it had picked up multiple migrants from two rubber boats in international waters off the coast of Libya. The NGO declared afterward: “Mission Lifeline fears that a similar situation to the Aquarius could be on the horizon,” referring to the other migrant ship that Italy (and Malta) refused entry last week and which ultimately had to steer to Spain. Mr. Salvini was elected on a platform of anti-immigration and the polling press admits that most Italians agree with his methods thus far. Let the new Inquisition begin by first excising the false Pope!